Giants rookie Chris Heston threw the 2015 season's first no-hitter on Tuesday, and he made it look easy. The 27-year-old righty, making his 13th major-league start, needed just 110 pitches to no-hit the Mets at Citi Field in a 5–0 win, and he drove in two of the Giants' five runs to boot. Heston's no-hitter was the majors' first since the Nationals' Jordan Zimmermann threw one on Sept. 28, 2014, the final day of the regular season. Since then, there have been two near-misses that were broken up in the ninth inning. Four Indians pitchers no-hit the Astros for 8 1/3 innings on April 9 before Jed Lowrie homered, while the Braves' Shelby Miller came within one out of finishing the job against the Marlins in May 17 before Justin Bour singled. 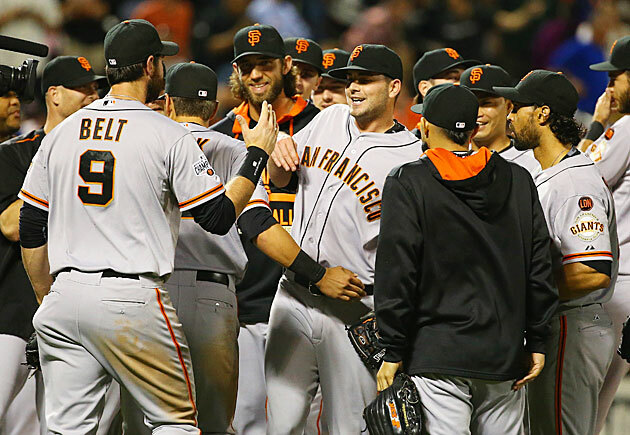 This was the 17th no-hitter in Giants history, and the fourth in as many seasons. Matt Cain threw a perfect game against the Astros in 2012, while Tim Lincecum no-hit the Padres in both 2013 and '14. Buster Posey was behind the plate for Heston, as he was for Cain and the first of Lincecum's pair. This was the seventh time in franchise history that the Mets have been on the wrong end of a no-hitter, but the first since Sept. 8, 1993, when the Astros’ Darryl Kyle did so. One of those seven came via the Giants: On Aug. 24, 1975, Ed Halicki no-hit the Mets at Candlestick Park. The last time the Mets were no-hit at home was by the Pirates’ Bob Moose on Sept. 20, 1969. After throwing 16 pitches in the first inning, Heston never needed more than 14 in any frame the rest of the way. Of his 110 pitches, 72 were strikes and he got ahead of 16 out of the 29 batters he faced with a first-pitch strike, though only once—on a Tejada grounder to lead off the seventh—did the Mets make a first-pitch out. Three times he needed 10 pitches or fewer to get his three outs. Via the PITCHf/x data at Brooks Baseball, he threw 68 sinkers with an average velocity of 90.6 mph and a high of 92.4, plus 36 curves and eight changeups. Seven of his 11 swings and misses came via the curve, five of them for strike three. Of his six strikeouts looking, five came via the sinker. Heston became just the third pitcher since 1914 to throw a no-hit, no-walk game in which the only batters to reach base came via a hit-by-pitches. The Braves' Lew Burdette (Aug. 18, 1960 against the Phillies) and the Marlins' Kevin Brown (June 10, 1997 against the Giants) each hit one batter. Three other pitchers hit one batter and walked none while completing a no-hitter, but allowed at least one other batter to reach base via an error. The only pitchers since 1914 to hit more than one batter while completing a no-hitter prior to Heston are the Tigers' Virgil Trucks (May 15, 1952 against the Senators) and the Angels' Bo Belinsky (May 5, 1962 against the Orioles). Heston's teammates wasted little time in staking him to a lead against Mets starter Noah Syndergaard, scoring a run in the first inning on a pair of singles and a fielder's choice. Heston aided his own cause in the fourth with the first two RBIs of his major-league career, singling to leftfield with the bases loaded and two outs to plate Posey and Crawford. Matt Duffy and Joe Panik added solo homers in the sixth and seventh, the latter off Dillon Gee, as the first batter he faced since being sent to the bullpen last week (so much for that six-man rotation). As for the Mets' offense, the team entered Tuesday ranked 13th in the league in scoring (3.78 runs per game) and 12th in bating average (.243), but even with injuries sidelining David Wright, Daniel Murphy and Travis d’Arnaud, the team had hit .286/.333/.452 in seven June games. They reached double digits in hits four times, including three of their four games against the Diamondbacks this past weekend, the last of which saw them hit four home runs. Even with the loss, at 31–28, they’re clinging to a half-game lead over the Nationals in the NL East. This may not have been the strongest team to be no-hit in recent years, but Mets fans can rest assured it was hardly the weakest. All in all, it was the night of a lifetime for Heston, a 12th-round 2009 draft pick out of East Carolina University who spent six years toiling in the minors before getting his first taste of major-league action late last September. Due to his advanced age and lack of dazzling stuff, the Baseball America Prospect Handbook 2015 ranked him No. 25 among the Giants prospects, calling him a "crafty righthander who succeeds without any pitch that grades out as even average" with a fringy repertoire starring an 86–89 mph two-seamer, curve and fringe-average changeup. Heston’s success lies in his ability to keep the ball on the ground; his 54% ground-ball rate ranks seventh in the league, and his knack for generating inning-ending double plays netted him the nickname "Hesto Presto" via Double A Richmond announcer Jon Laaser (yes, Laaser). Heston joined the Giants rotation on April 8, when he replaced Cain, who went on the disabled list with a strained flexor and has yet to return. His performance thus far has been feast or famine. Including the no-hitter, he has seven starts in which he’s allowed two or fewer runs, and five where he’s allowed five or more, including three of his previous four starts coming into Tuesday night. His best game prior to Tuesday’s gem was a two-hit, 10-strikeout outing against the Astros on May 12. Including the no-hitter, he has a 3.77 ERA, 3.32 FIP and 8.0 K/9, numbers that make a case for him as the team’s third-best starter behind Madison Bumgarner and the resurgent Lincecum. The Giants are 8–4 in his starts, and 33–26 overall, good for second in the NL West (one game behind the Dodgers, who defeated the Diamondbacks, 3–1). With Cain and Jake Peavy both on rehab assignments, manager Bruce Bochy will soon have to figure out how to reconfigure his starting five. In putting together the signature moment of the defending champions’ season to date, Heston’s impressive effort certainly bolstered his chances of keeping his spot.